That look in his eye at the end clearly says "I completely understand and respect your feelings my granddaughter. Want to head to the zoo and pet baby goats?" Unfortunately, if he were a reasonable man that understands boundaries, he clearly wouldn't be Zeus. I am reminded how I did a bit of wiki-walking and ended up looking at a family tree for the mythological royal family of Thebes. Zeus is in there four times, of about 20 characters. All things considered, he takes it VERY well, but it's implied he's learned to play the long game. So I've decided to accept that this is a thing by throwing out -everything- I know of how the Titans were handled in the New-52. I am so much happier. This is much more in line with what I like out of my Tita-Young Justice. 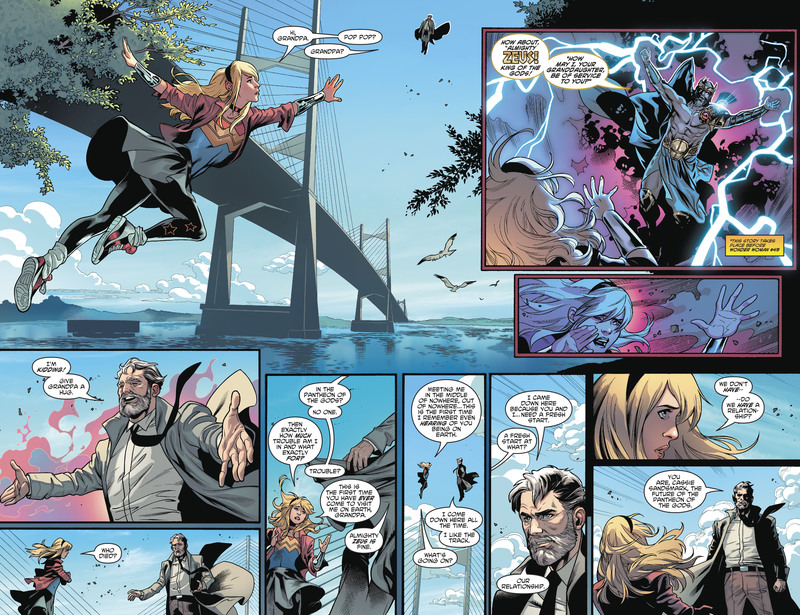 This is odd, seems like Bendis is doing his own thing with Cassie, completely separate from her previous iterations. I'm not opposed. 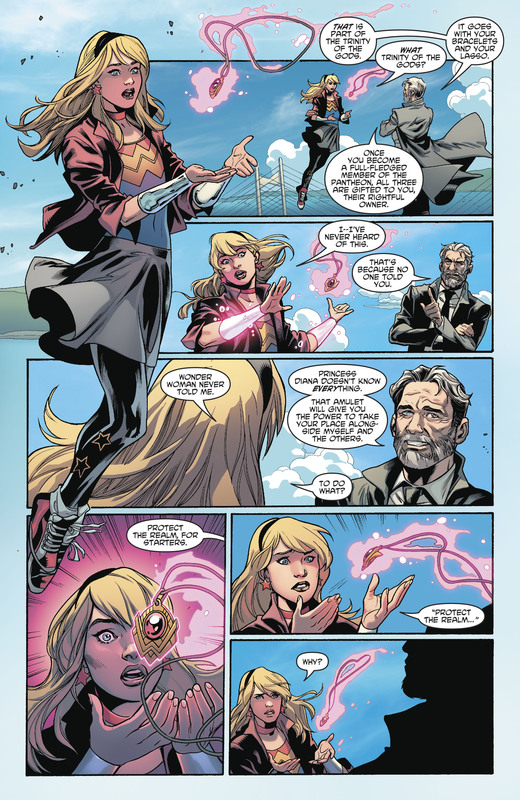 No one's really come up with a good storyline for Cassie coming into her own as a demi-goddess since Johns' retconned Zeus into her parentage. 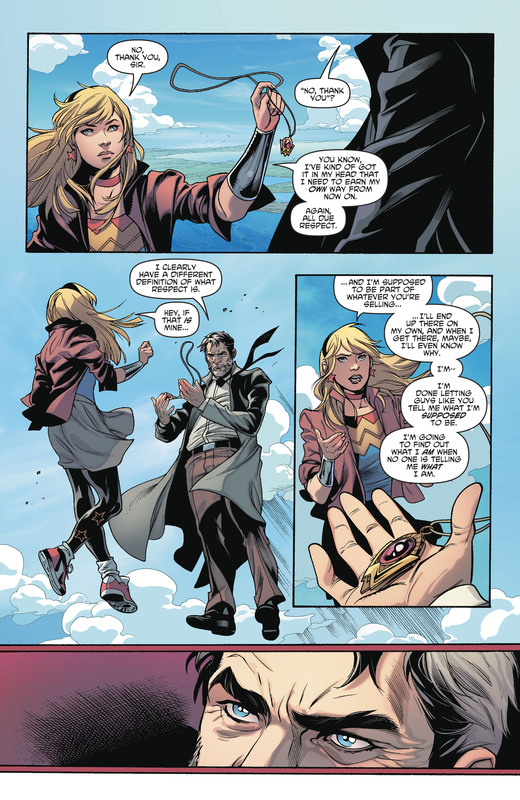 She just kinda randomly got a lasso from Ares and became his champion? Nu52 Cassie's awful spikey masochistic armor was another bad memory I'd like to forget. Wait, confusion. Is Diana still Zeus's daughter? Does that make Cassie her niece? Man, DC is just embracing the 'continuity is what we say it is, right now' method of madness. Diana as Zeus's daughter came up pretty recently, in Robinson's neverending run that pretty much ignored all of the hard work that Rucka did in creating a new status quo for Diana in Rebirth. The little editor box even references Robinson's arc where Zeus died. Did Zeus come back already? Even for a deity, that didn't take long. But of course Cassie can't be Diana's sibling. That would make Jason less special. Little editor's box says that this is before he died. Ah, I didn't see that. Thanks. Zeus was her dad, now he's her grandfather? So who's her father? Lennox, he was a demigod that Azzarello introduced in nu52 WW. A British dude and ally of Diana's. I think he could turn into stone or something. He died during the run. When did this happen? The Wonder Family tree confuses the heck out of me. christ, will that ill conceived demon of bad DC decisions never stop haunting us?